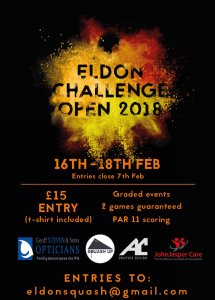 SQUASH UP and ELDON SQUASH present Eldon Challenge Open 2018. This event is open to everyone and all abilities. Event to be held at Eldon Leisure Squash club. – PAR 11 (2 clear). – Winner marks the next game. – 1st round losers enter the plate competition. – Please arrive 15 minutes before your game is scheduled to start. – First round Friday evening, Quarter Final Saturday morning, Semi-Final Saturday late afternoon and Finals Sunday late afternoon. 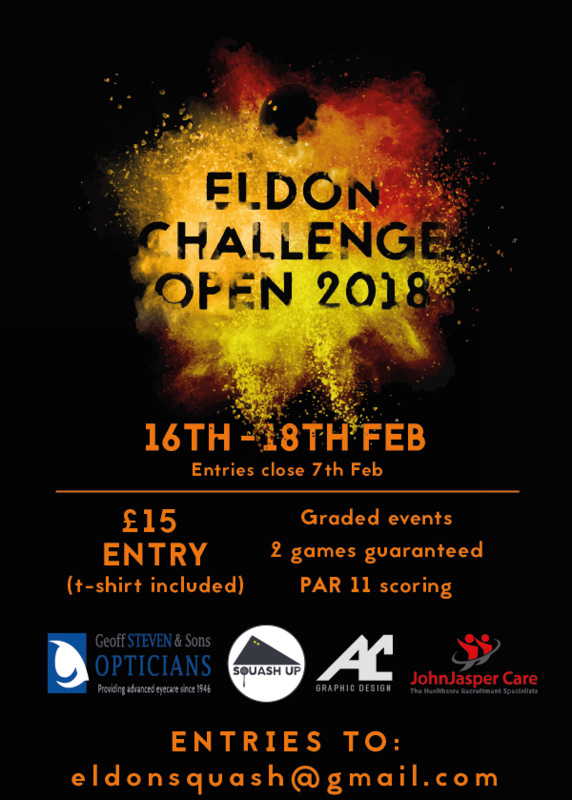 – Entry fee £15 made payable to Eldon Challenge Open 2018 before closing date (7th Feb 2018). Please send your name and phone number to eldonsquash@gmail.com and guyalberteniona@hotmail.com plus indication of standard and t-shirt size.